In one of the previous posts about postprocessors, I wrote that the NC program is generated in relation to the coordinate system. Well, this is not surprising. We must have some reference, because on the machine we also define the origin of the coordinate system – the base. And the base from the CAM system must be compatible with the base on the machine. Now, let’s take a look at our drawing. If we assume that the rectangle specifies the stock, then the base is not defined on the rectangle, it is only offset by some value in the XY axes. We assume that we want to have the origin of the coordinate system in the lower left corner of the rectangle. How to do it? Various approaches are used in various CAM systems. In one, the origin of the coordinate system is defined relative to the geometry, i.e., we indicate the place on the model in which the base is to be. 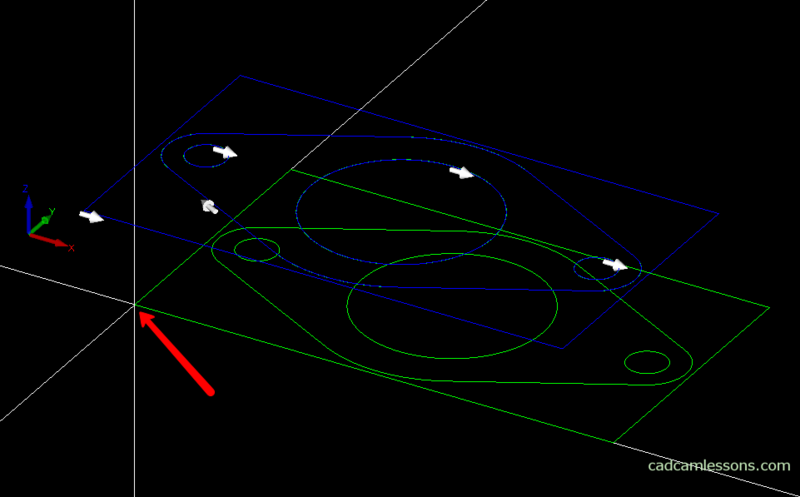 In other CAM systems, the origin of the coordinate system is fixed and the geometry is set to it. This is also the case for Alphacam. So here we have to move the geometry to the origin of the coordinate system, not vice versa. Why am I writing about it? I work in several CAM systems and I have met a few more. At the beginning of working with CAM systems I worked in a way in which the origin of the coordinate system was defined on the model at the very beginning of the work. It was one of the first steps to be taken before defining machining strategies. If it was necessary to change the location of the base, it was also done by indicating its beginning on the model. Later, when I started working with Alphacam, it was hard for me to change, that we do not move the coordinate system, only everything else – geometries and tool paths. 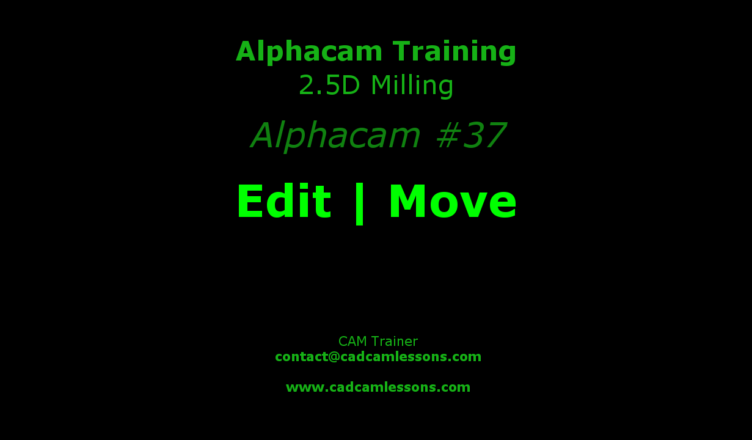 Therefore, someone who has worked in a different system and is switching to Alphacam may be surprised by this approach. You can get used to it quickly and this is not a problem. Ok, so we have to move the geometry to the origin of the coordinate system. Choose Edit | Move. We want to move all geometries, so click the All on the command line button. Accept by clicking RMB. In the next step, we need to specify the Base Point. It is a point on the geometry to which we will attach all the geometries and then determine where this point will be moved. We want to place the origin of the coordinate system in the lower left corner of the rectangle, so let’s choose this point as a base point. Use the END-point of snap. you can see in the drawing above, as well as when moving the geometry in the working area, all are attached to the base point that we pointed out. Now we have to determine the place where we will move this point. As you can guess, we want to move this point to the coordinates X0 Y0. Enter these coordinates on the command line and click OK. The geometry has been moved to the origin of the coordinate system. In the next posts I will show how to set the material and how to perform machining simulations.